Over the weekend it rained nearly non-stop. Torrential, buckets of rain. I suppose since this is the only rain Los Angeles is getting for probably the rest of the year, it has to get it all in? On Saturday I accompanied my sister on her side hustle, which is grocery shopping and delivery. We had to brave the rain through four Trader Joe's shopping trips, but at least they all had different free samples (tell me I'm not the only one who feels motivated to go there for the samples alone). At the end of the day just before sunset there was the most beautiful rainbow, or so I saw on Instagram, on multiple accounts. Sadly, we missed it. Sunday was set out to be another full day of rain, but the sun came out for a bit, and we diverted from another grocery store run to snap these photos. Just as we finished all the clouds rolled back in and the rain resumed. Fingers crossed there will be more bright skies for the rest of my stay, especially because the only boots I brought are suede, and this jacket is both missing its hood, and isn't waterproof. P.S. I'm terrible at packing. 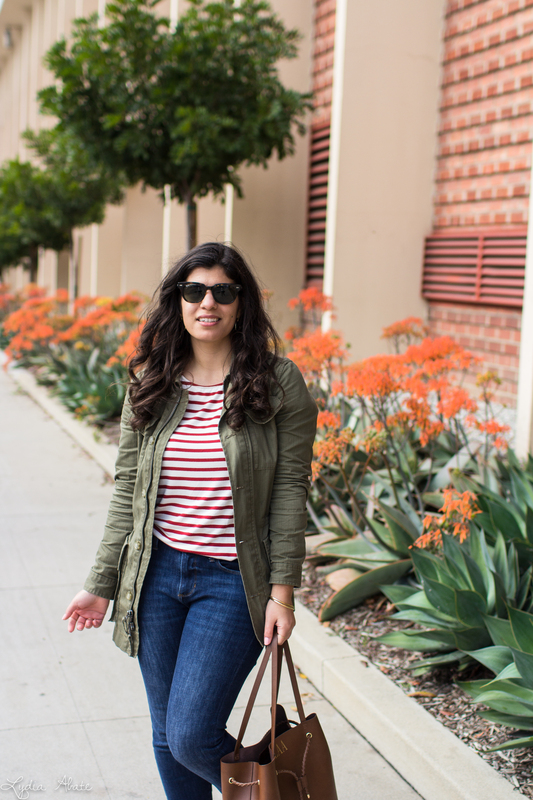 This is a great outfit to do errands in! And Oh my I just love Trader Joe's. I get excited going there haha! Love this look, yay for a break in the rain!! I never remember to bring proper rain attire on trips, haha. I usually forget an umbrella too. Sounds like you made the best of your rainy weekend! And I totally love this outfit!! Sometimes a rainy weekend is nice! I like being cozy inside when it rains outside. Especially in LA where it never does! Loving that cute monogram bag too. I heard about all the rain in LA - hope it made for an extra cozy weekend! Also, loving your gorgeous bag. So cute! I hope you get some nice weather for the remainder of your trip (or maybe find some cute rain boots and a jacket that you want to treat yourself to). 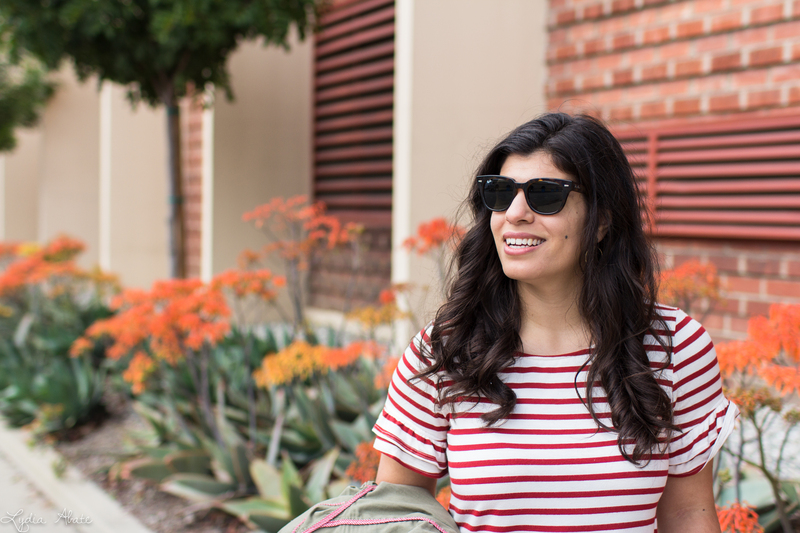 I love your stripes and bag! I too am motivated by the samples. Glad you got time with your sister. 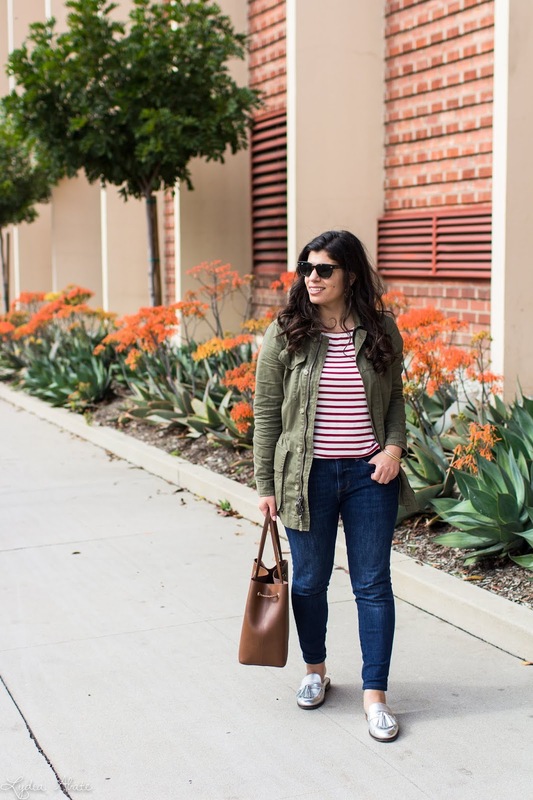 Even if it's not the most practical outfit for the torrential rain you look so cute an I like the red stripes with the olive jacket - I definitely need to try this combo, I have a striped tee and olive pants! :) Once our weather has cooled down definitely. I'm glad you're still enjoying your time despite the bad weather! Over here the rain is a welcome change as it's broken the heat and humidity - I don't mind it at all! I think one of the reasons we have a Costco membership is the samples! Trader Joes is fun to visit for the same reason! I hope you have lots of sunshine the rest of your stay! 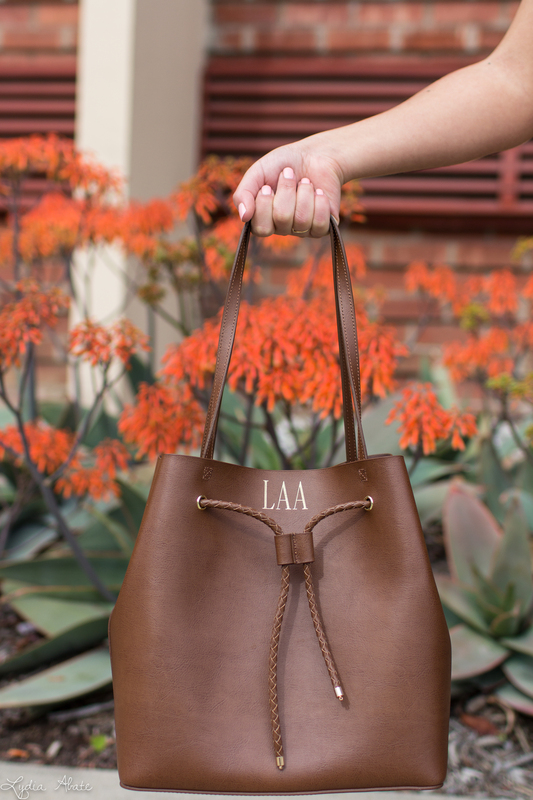 This monogram bucket bag is SO cute!! Love the color, it's perfect. At least you guys made it a fun weekend. LA def doesn't get enough rain, so enjoy it while you can! But doesn't the song say It never rains in California?? I wouldn't have brought raingear either!! I love your combination. We experienced the rain just last week. I was so happy to see it rain again. 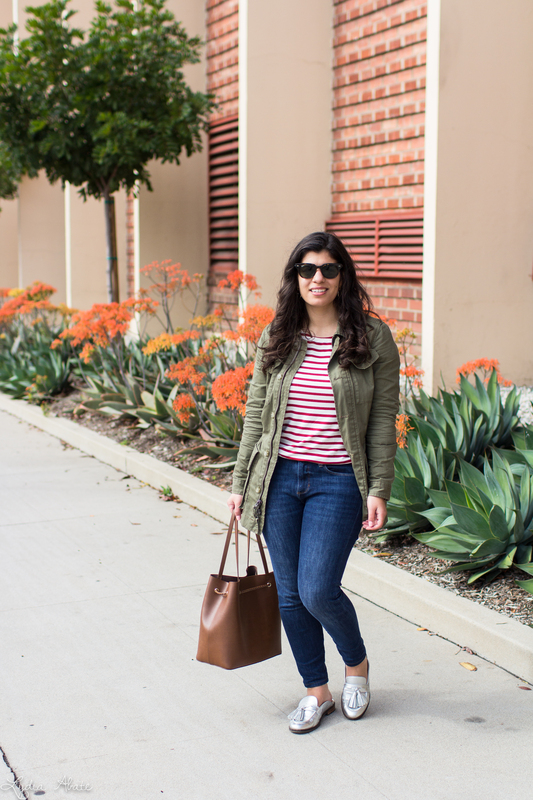 Love you metallic shoes and stripe top! This is such a classic look! This outfit is perfect for running errands and dodging raindrops. 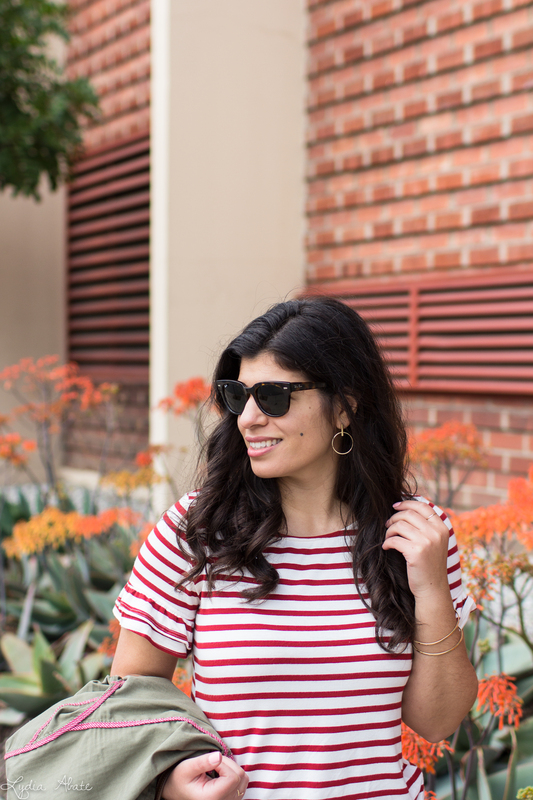 Love the stripes and the red with the green. So cute! 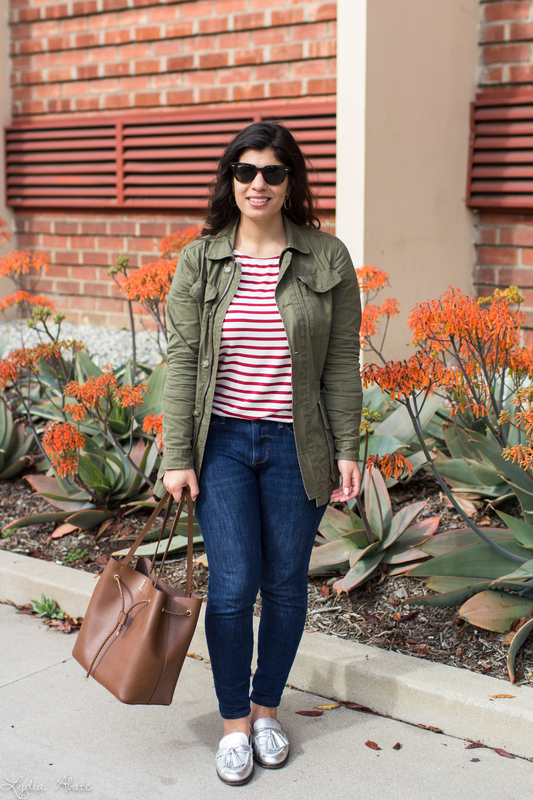 This outfit is perfect- love the olive utility coat with the red stripes. Glad it stopped raining for a bit so you could capture it! I'm glad you caught some sun! I probably would have made the same mistakes--it is California after all. With all the winter happening around here I would have just figured it's all warm weather and sunshine there! :) Maybe not the most practical of packing, but this sure is a cute outfit! I lived in LA a while back and I moved there at the end of January. It was sunny for two days and then rained for almost a month straight. Isn't there a song "It Never Rains in Southern California'? You are right though, it needs to soak it all up now, because it won't rain for 10 months! Love this look on you, your silver mules are so fun! This is such a great jacket. It rains up here quite a bit (I'm near Seattle) and wearing jackets like this works for our weather. I know there was such a drought there so I am glad to hear that it is raining! I love jackets like these! they are so versatile and nearly go with EVERYTHING! I like the pictures, that jacket in particular. I do love that jumpsuit. The color is gorgeous and the flowiness is so light! The suede is gorgeous and I love it! Cute look dear! Loving the bag and mules you have here, so pretty with the striped top. Love your bag and shoes! Sorry it rained during so much of your trip. Hoping the sun came out for you for the rest of it! Also TJ's samples are always a good idea haha.